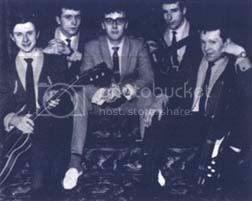 This group from Stourbridge had two tracks included on a rare compilation album entitled “Brum Beat” that was put out by Decca Records in 1964. They had previously won a beat group contest sponsored by the Birmingham Evening Despatch. The group also had a single released on Phillips Records in 1965. Dave Lacey and The Corvettes should not be confused with another group called The Corvettes from Birmingham who were on a different compilation LP called “Brum Beat” that was released by the Dial Records label in 1964.
great times. never happen again magical sixties good to have been there ! Hello Winston, Remember Me? You were stuck for a drummer, must have been the early 1980’s. I stood in a couple of times. I’m almost sure your drummer was a football ref and he couldn’t make it then. The first of the two was at Stourport British Legion. I think you were playing a Guild and there was another guitarist called Richard, I think with a Strat. Dave was playing bass and singing.You played loads of stuff I was familiar with and I thoroughly enjoyed it. I’m from Kidderminster. My dad was a roadie for Dave lacy and the corvettes back in the sixties (John Head). It is coming up to his 50th wedding anniversary in August. A card or some correspondence would be greatly appreciated, he often still remanises of you all.